According to Jenni: We are all survivors of the Rwandan Genocide #kwibuka21 personal story. 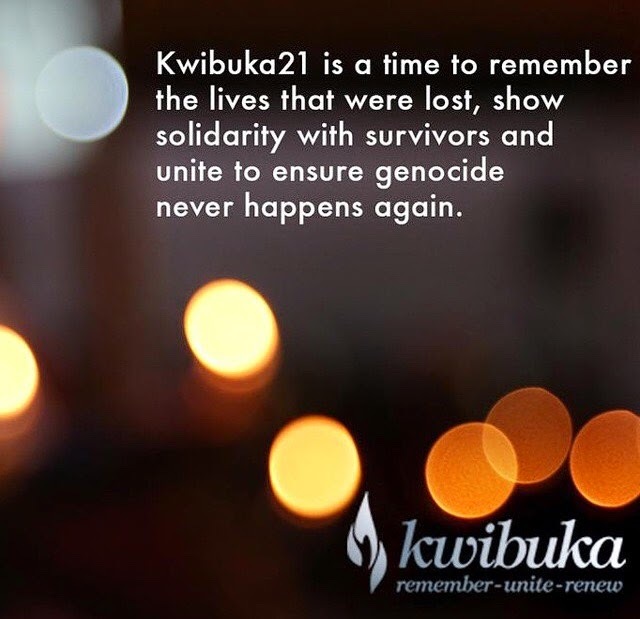 We are all survivors of the Rwandan Genocide #kwibuka21 personal story. 21 years. It seems like a lifetime ago. It is the memorium of The Genocide in Rwanda that took a million lives and left bleeding souls all over the country. Every Rwandan I know, has lost someone or is close to someone who has. This story I am going to tell is close to home, close to my heart. April 8th 1994, 9 am in the morning, the chaos of what looks like a burgalary is all around a small suburban home in an old and deserted neighbourhood. You could hear roasters, birds, dogs barking and a child crying. In the backyard, on the unpaved red earthed floor, was two dead bodies. Husband and wife, beat, bludgeoned, and violated to the greatest extent. The woman's breast cut off and her young 2 year old child sitting in the blood beside her. She's crying because her mother is unresponsive, her father isn't moving and the scene is frightful. Little girl has been there all night and hasn't moved her parents side. Yesterday, 5pm, they came. The crazed, inhumane eyed monsters invaded the neighbourhood and cries and death filled Tutsi homes. A mother run inside her house and hid her 2 year old daughter in her room. She closed the door and joined her husband outside who was trying to give up everything he owned for his family to be spared. No one knows what happened that day. People heard a woman cry quietly and painful screams en sue. No one knows how the poor little girl crawled from her room to the backyard. No one knows. All we know is the horrific scene found the next morning and the scars it left. This month, we remember. We think about those lost lives and their last moments on earth. We think about what little 2 year old shami's life has been. Always on my mind. This is dedicated to all lives lost, all families left behind, all men and women who died undignified but with dignity. They accept death because they knew there was no other way. Some stayed quiet to not frighten their children. They accepted it and chose to go with dignity. Buy the Hotel Rwanda movie here. You will find some insight on the tragic events in 1994.